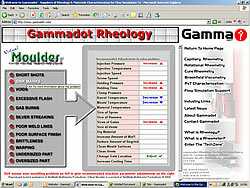 Welcome to the Gammadot Rheology Techzone! 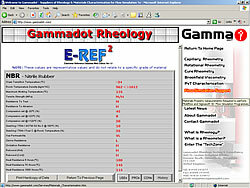 Description: Structural, Thermal & Rheological properties overview for 20 thermoplastic generic types, including graphical plots & service information. 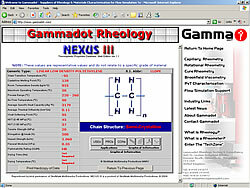 Description: Physical, Thermal & Rheological properties overview for 18 rubber generic types, including graphical plots & service / historical information. 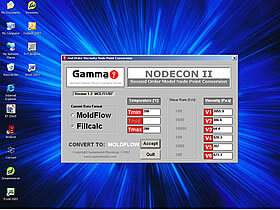 Description: Injection moulding process settings adviser covering 12 common moulding problems, including problem overview with photographic examples. 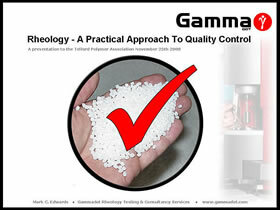 Description: A evening lecture presented to the Telford Polymer Association on 28th November 2008 highlighting the practical benefits of controlled stress rheometry as a quality control tool.